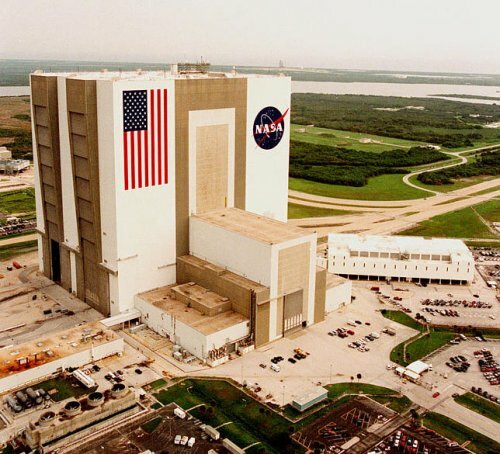 The Vertical Assembly Building (VAB) is a large facility where the Space Shuttle Orbiter was joined to the Solid Rocket Boosters and the External Tank, and where, in the 1960s and 70s, Saturn V components were assembled. One of the largest buildings in the world, the 52-storey, 160-meter (525 feet) tall VAB occupies a ground area of 3.25 hectares (8 acres) and has an internal volume of 3,665,013 cubic meters (129,428,000 cubic feet). Designed to withstand winds of 200 kilometers per hour, it has a foundation that rests on more than 4,225 steel pilings, each 40 centimeters in diameter that goes to a depth of 49 meters through bedrock. The Vertical Assembly Building contains four High Bays (making up the four corner regions of the tall block in the photo) and one Low Bay (the smaller block jutting out back). High Bays 1 and 3 were used for integrating and stacking the complete Space Shuttle vehicle. High Bay 2 was used for External Tank (ET) checkout and storage and as a contingency storage area for orbiters. High Bay 4 was also used for ET checkout and storage, as well as for payload canister operations and Solid Rocket Booster (SRB) contingency handling. The Low Bay area contained Space Shuttle main engine maintenance and overhaul shops, and served as a holding area for SRB forward assemblies and aft skirts. During Space shuttle build-up operations inside the VAB, integrated SRB segments were transferred from nearby SRB assembly and checkout facilities, hoisted onto a Mobile Launcher Platform in High Bays 1 or 3 and mated together to form two complete SRBs. The External Tank, after arrival by barge, was inspected and checked out in High Bays 2 or 4 and then transferred to High Bay's 1 or 3 to be attached to the SRBs already in place. The orbiter was then towed over from the Orbiter Processing Facility to the VAB transfer aisle, raised to a vertical position, lowered onto the Mobile Launcher Platform and then mated to the rest of the stack. When assembly and checkout is complete, the crawler-transporter entered the High Bay, picked up the platform, and assembled shuttle vehicle and carried them to the launch pad.